More people are keeping are keeping their teeth longer and are expecting faulty teeth to be repaired rather than pulled out. Dental crowning is one of the various ways you can restore your tooth appearance and it can last for many years to come. However there can be times whereby the old crown can get infected and create problems in the mouth. A dental crown is made from an artificial material to cover a broken or decayed tooth. Crowning or “capping” is a dental procedure which involves reducing the surface of the tooth and replacing the surface with a crown. 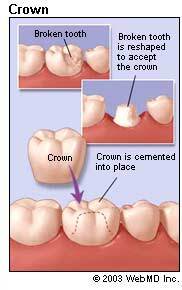 When do you need to crown a tooth? As an aggressive form of treatment for staining and discoloration of teeth. Why does a dental crown get infected? 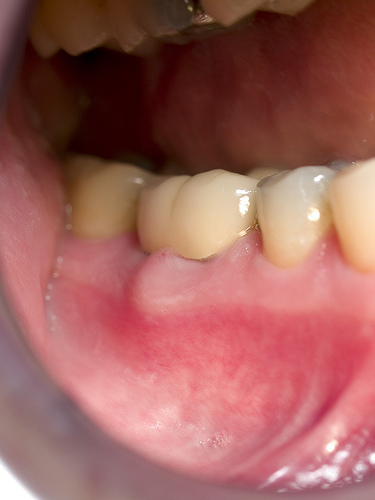 The lack of proper plaque removal will result in inflammation around the margins of the crown teeth especially in the areas between the teeth leading to gum disease. Excessive sugar consumption and those with dry mouths, which can be caused by systemic diseases like diabetes, old age or side effects of drugs, can develop extensive decay in their teeth and spread to dental crowns. Recurrent tooth decay can also lead to infection of the old crown due to poor root canal therapy or failed fillings. Decay underneath a crown of tooth is difficult to detect and if the decay is overlooked, the disease may rapidly progress to the point where a new crown replacement becomes inevitable or even worse, where tooth loss results. How do I know my crown is infected? How to treat a tooth with an infected old crown? Decay around the crown margins that is detected early can be repaired using composite or glass ionomer cement. The actual cause has to be investigated and preventive measures applied. In some cases a minor surgery may be needed whereby a gum flap is raised to treat tooth decay beneath the gums so that any necessary treatment to the gums or root of the tooth can be carried out at the same time. Using ultrasonic scalers to break the luting cement between the tooth and the crown. Using a crown remover, a device that has a spring loaded system that delivers a mechanical shock in an attempt to break the luting cement seal. Cutting a vertical groove on the crown, across the biting surface and wedging open the crown. However this is a crude method as the old crown would be destroyed and it is only used as a last resort. 1. 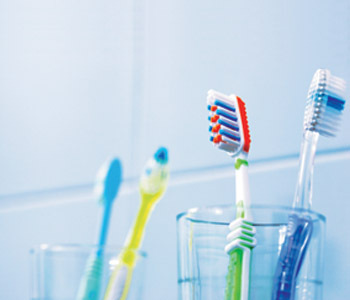 Brush thoroughly twice a day (preferably in the morning and before bed) using a soft bristled toothbrush and clean between teeth daily in areas where your toothbrush can not reach – The reason we brush and floss is to remove a colorless film that constantly forms on the teeth called plaque. Plaque is one of the main causes of tooth decay and gum disease. Major conditions of gum disease can be reduced by regular toothbrushing with fluoride toothpaste. The fluoride in toothpaste serves to prevent, control and arrest tooth decay. Good oral hygiene should be practiced to avoid any bacterial infection to the crowned tooth. 2. Eat a well-balanced diet and restrict sugar-containing foods to mealtime –Reducing the amount and frequency of sugary food intake can reduce tooth decay and could help control weight. Having a healthy diet keeps your gums healthy and strengthens your immune system. If you are on medications, make sure your medicines are sugar-free. 3. Do not smoke or use tobacco–Smoking increases the risk of gum disease and reduces the healing ability of the gums. 4. Visit your dentist regularly (at least twice a year) for a professional cleaning and examination of your mouth – Plaque can build up in areas where your toothbrush can not reach and will then harden to form tartar or calculus which can only be removed by your dentist. Regular dental checkups can allow early detections of tooth infections and enable treatment to be done as soon as possible. How to Clean a Temporary Tooth Crown? This entry was posted in Oral Care and tagged crown a tooth, crown of tooth, crown on tooth, crown teeth, crown tooth pain, dental crown, infected old crown, root canal on January 19, 2011 by oileng.